This article is about the Latvian capital. For other uses, see Riga (disambiguation). Riga (/ˈriːɡə/; Latvian: Rīga [ˈriːɡa] ( listen), Livonian: Rīgõ) is the capital and largest city of Latvia. With 637,827 inhabitants (2018), it is also the largest city in the three Baltic states, home to one third of Latvia's population and one tenth of the three Baltic states' combined population. The city lies on the Gulf of Riga, at the mouth of the Daugava river. Riga's territory covers 307.17 km2 (118.60 sq mi) and lies 1–10 m (3 ft 3 in–32 ft 10 in) above sea level, on a flat and sandy plain. Riga was founded in 1201 and is a former Hanseatic League member. Riga's historical centre is a UNESCO World Heritage Site, noted for its Art Nouveau/Jugendstil architecture and 19th century wooden architecture. Riga was the European Capital of Culture during 2014, along with Umeå in Sweden. Riga hosted the 2006 NATO Summit, the Eurovision Song Contest 2003, the 2006 IIHF Men's World Ice Hockey Championships and the 2013 World Women's Curling Championship. It is home to the European Union's office of European Regulators for Electronic Communications (BEREC). In 2016, Riga received over 1.4 million visitors. It is served by Riga International Airport, the largest and busiest airport in the Baltic states. Riga is a member of Eurocities, the Union of the Baltic Cities (UBC) and Union of Capitals of the European Union (UCEU). One theory about the origin of the name Riga is that it is a corrupted borrowing from the Liv ringa meaning loop, referring to the ancient natural harbour formed by the tributary loop of the Daugava River. The other is that Riga owes its name to this already-established role in commerce between East and West, as a borrowing of the Latvian rija, for threshing barn, the "j" becoming a "g" in German — notably, Riga is called Rie by English geographer Richard Hakluyt (1589), and German historian Dionysius Fabricius (1610) confirms the origin of Riga from rija. Another theory could be that Riga was named after Riege, the German name for the River Rīdzene, a tributary of the Daugava. Another theory is that Riga's name is introduced by the bishop Albert, initiator of christening and conquest of Livonian and Baltic people. He introduced also an explanation of city name as derived from Latin rigata ("irrigated") that symbolizes an "irrigation of dry pagan souls by Christianity". The river Daugava has been a trade route since antiquity, part of the Vikings' Dvina-Dnieper navigation route to Byzantium. A sheltered natural harbour 15 km (9.3 mi) upriver from the mouth of the Daugava — the site of today's Riga — has been recorded, as Duna Urbs, as early as the 2nd century. It was settled by the Livs, an ancient Finnic tribe. Riga began to develop as a centre of Viking trade during the early Middle Ages. Riga's inhabitants occupied themselves mainly with fishing, animal husbandry, and trading, later developing crafts (in bone, wood, amber, and iron). The Livonian Chronicle of Henry testifies to Riga having long been a trading centre by the 12th century, referring to it as portus antiquus (ancient port), and describes dwellings and warehouses used to store mostly flax, and hides. German traders began visiting Riga, establishing a nearby outpost in 1158. Along with German traders the monk Meinhard of Segeberg also arrived to convert the Livonian pagans to Christianity. Catholic and Orthodox Christianity had already arrived in Latvia more than a century earlier, and many Latvians baptised. Meinhard settled among the Livs, building a castle and church at Ikšķile, upstream from Riga, and established his bishopric there. The Livs, however, continued to practice paganism and Meinhard died in Ikšķile in 1196, having failed in his mission. In 1198, the Bishop Berthold arrived with a contingent of crusaders and commenced a campaign of forced Christianization. Berthold died soon afterwards and his forces defeated. The Church mobilised to avenge the issuance of a bull by Pope Innocent III declaring a crusade against the Livonians. Bishop Albert was proclaimed Bishop of Livonia by his uncle Hartwig of Uthlede, Prince-Archbishop of Bremen and Hamburg in 1199. Albert landed in Riga in 1200 with 23 ships and 500 Westphalian crusaders. In 1201, he transferred the seat of the Livonian bishopric from Ikšķile to Riga, extorting agreement to do this from the elders of Riga by force. The year 1201 also marked the first arrival of German merchants in Novgorod, via the Dvina. To defend territory and trade, Albert established the Order of Livonian Brothers of the Sword in 1202, which was open to nobles and merchants. The Christianization of the Livs continued. In 1207, Albert started to fortify the town. Emperor Philip invested Albert with Livonia as a fief and principality of the Holy Roman Empire. To promote a permanent military presence, territorial ownership was divided between the Church and the Order, with the Church taking Riga and two-thirds of all lands conquered and granting the Order a third. Until then, it had been customary for crusaders to serve for a year and then return home. Albert had ensured Riga's commercial future by obtaining papal bulls which decreed that all German merchants had to carry on their Baltic trade through Riga. In 1211, Riga minted its first coinage, and Albert laid the cornerstone for the Riga Dom. Riga was not yet secure as an alliance of tribes failed to take Riga. In 1212, Albert led a campaign to compel Polotsk to grant German merchants free river passage. Polotsk conceded Kukenois (Koknese) and Jersika to Albert, also ending the Livs' tribute to Polotsk. Riga's merchant citizenry chafed and sought greater autonomy from the Church. In 1221, they acquired the right to independently self-administer Riga and adopted a city constitution. That same year Albert was compelled to recognise Danish rule over lands they had conquered in Estonia and Livonia. Albert had sought the aid of King Valdemar of Denmark to protect Riga and Livonian lands against Liv insurrection when reinforcements could not reach Riga. The Danes landed in Livonia, built a fortress at Reval (Tallinn) and set about conquering Estonian and Livonian lands. The Germans attempted, but failed, to assassinate Valdemar. Albert was able to reach an accommodation with them a year later, however and, in 1222, Valdemar returned all Livonian lands and possessions to Albert's control. Albert's difficulties with Riga's citizenry continued; with papal intervention, a settlement was reached in 1225 whereby they no longer had to pay tax to the Bishop of Riga, and Riga's citizens acquired the right to elect their magistrates and town councillors. In 1226, Albert consecrated the Dom Cathedral, built St. James's Church, (now a cathedral) and founded a parochial school at the Church of St. George. In 1227, Albert conquered Oesel and the city of Riga concluded a treaty with the Principality of Smolensk giving Polotsk to Riga. Albert died in January 1229. He failed in his aspiration to be anointed archbishop but the German hegemony he established over the Baltic would last for seven centuries. In 1282, Riga became a member of the Hanseatic League. The Hansa was instrumental in giving Riga economic and political stability, thus providing the city with a strong foundation which endured the political conflagrations that were to come, down to modern times. As the influence of the Hanseatic League waned, Riga became the object of foreign military, political, religious and economic aspirations. Riga accepted the Reformation in 1522, ending the power of the archbishops. In 1524, iconoclasts targeted a statue of the Virgin Mary in the Cathedral to make a statement against religious icons. It was accused of being a witch, and given a trial by water in the Daugava River. The statue floated, so it was denounced as a witch and burnt at Kubsberg. 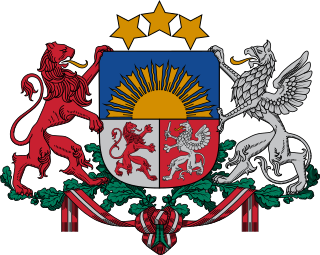 With the demise of the Livonian Order during the Livonian War, Riga for twenty years had the status of a Free Imperial City of the Holy Roman Empire before it came under the influence of the Polish–Lithuanian Commonwealth by the Treaty of Drohiczyn, which ended the war for Riga in 1581. 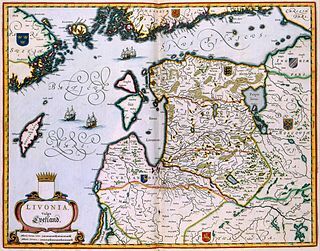 In 1621, during the Polish–Swedish War (1621–1625), Riga and the outlying fortress of Daugavgriva came under the rule of Gustavus Adolphus, King of Sweden, who intervened in the Thirty Years' War not only for political and economic gain but also in favour of German Lutheran Protestantism. During the Russo-Swedish War (1656–1658), Riga withstood a siege by Russian forces. Riga remained the largest city in Sweden until 1710, a period during which the city retained a great deal of autonomous self-government. In that year, in the course of the Great Northern War, Russia under Tsar Peter the Great besieged plague-stricken Riga. Along with the other Livonian towns and gentry, Riga capitulated to Russia, but largely retained their privileges. Riga was made the capital of the Governorate of Riga (later: Livonia). Sweden's northern dominance had ended, and Russia's emergence as the strongest Northern power was formalised through the Treaty of Nystad in 1721. Riga became an industrialised port city of the Russian empire, in which it remained until World War I. By 1900, Riga was the third largest city in Russia after Moscow and Saint Petersburg in terms of the number of industrial workers and number of theatres. German troops entering Riga during World War I. During these many centuries of war and changes of power in the Baltic, and despite demographic changes, the Baltic Germans in Riga had maintained a dominant position. By 1867, Riga's population was 42.9% German. Riga employed German as its official language of administration until the installation of Russian in 1891 as the official language in the Baltic provinces, as part of the policy of Russification of the non-Russian speaking territories of the Russian Empire, including Congress Poland, Finland and the Baltics, undertaken by Tsar Alexander III. More and more Latvians started moving to the city during the mid-19th century. The rise of a Latvian bourgeoisie made Riga a centre of the Latvian National Awakening with the founding of the Riga Latvian Association in 1868 and the organisation of the first national song festival in 1873. The nationalist movement of the Neo-Latvians was followed by the socialist New Current during the city's rapid industrialisation, culminating in the 1905 Revolution led by the Latvian Social Democratic Workers' Party. The 20th century brought World War I and the impact of the Russian Revolution of 1917 to Riga. As a result of the battle of Jugla, the German army marched into Riga on 3 September 1917. On 3 March 1918, the Treaty of Brest-Litovsk was signed, giving the Baltic countries to Germany. Because of the Armistice with Germany of 11 November 1918, Germany had to renounce that treaty, as did Russia, leaving Latvia and the other Baltic States in a position to claim independence. Latvia, with Riga as its capital city, thus declared its independence on 18 November 1918. Between World War I and World War II (1918–1940), Riga and Latvia shifted their focus from Russia to the countries of Western Europe. The United Kingdom and Germany replaced Russia as Latvia's major trade partners. 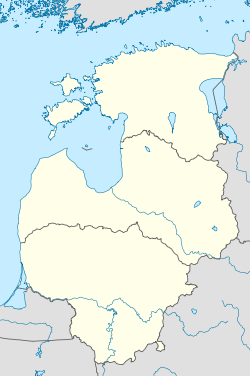 The majority of the Baltic Germans were resettled in late 1939, prior to the occupation of Estonia and Latvia by the Soviet Union in June 1940. During World War II, Latvia was incorporated in the Soviet Union in June 1940 and then was occupied by Nazi Germany in 1941–1944. On June 17, 1940, the Soviet forces invaded Latvia occupying bridges, post/telephone, telegraph, and broadcasting offices. Three days later, Latvian president Karlis Ulmanis was forced to approve a pro-Soviet government which had taken office. On July 14–15, rigged elections were held in Latvia and the other Baltic states, The ballots held following instructions: "Only the list of the Latvian Working People's Bloc must be deposited in the ballot box. The ballot must be deposited without any changes." The alleged voter activity index was 97.6%. Most notably, the complete election results were published in Moscow 12 hours before the election closed. Soviet electoral documents found later substantiated that the results were completely fabricated. Tribunals were set up to punish "traitors to the people" - those who had fallen short of the "political duty" of voting Latvia into the USSR and those who failed to have their passports stamped for so voting were allowed to be shot in the back of the head. The Soviet authorities, having regained control over Riga and Latvia imposed a regime of terror, opening the headquarters of the KGB, massive deportations started. Hundreds of men were arrested, including leaders of the former Latvian government. The most notorious deportation, the June deportation took place on June 13 and June 14, 1941, estimated at 15,600 men, women, and children, and including 20% of Latvia's last legal government. Similar deportations were repeated after the end of WWII. The building of the KGB located in Brīvības iela 61, known as 'the corner house', is now a museum. Stalin's deportations also included thousands of Latvian Jews. (The mass deportation totalled 131,500 across the Baltics.) Similar atrocities were made after the Nazi occupation of Latvia when the city's Jewish community was forced into the Riga Ghetto and a Nazi concentration camp was constructed in Kaiserwald. On 25 October 1941, the Nazis relocated all Jews from Riga and the vicinity to the ghetto. Most of Latvia's Jews (about 24,000) were killed on 30 November and 8 December 1941 in the Rumbula massacre. By the end of the war, the remaining Baltic Germans were expelled to Germany. The Soviet Red Army re-entered Riga on 13 October 1944. In the following years the massive influx of labourers, administrators, military personnel, and their dependents from Russia and other Soviet republics started. Microdistricts of the large multi-storied housing blocks were built to house immigrant workers. By the end of the war, Rīga's historical centre was heavily damaged because of constant bombing. After the war, huge efforts were made to reconstruct and renovate most of the famous buildings that were part of the skyline of the city before the war. Such buildings were, amongst others: St. Peter's Church which lost its wooden tower after a fire caused by the Wehrmacht (renovated in 1954). Other example is The House of the Blackheads, completely destroyed, its ruins were subsequently demolished. A facsimile was subsequently constructed in 1995. In 1989, the percentage of Latvians in Riga had fallen to 36.5%. In 2004, the arrival of low-cost airlines resulted in cheaper flights from other European cities such as London and Berlin and consequently a substantial increase in numbers of tourists. In November 2013, the roof of a supermarket collapsed, possibly as a result of the weight of materials used in the construction of a garden on the roof. At least 54 people were killed. The Latvian President Andris Berzins described the disaster as "a large scale murder of many defenceless people". Riga was the European Capital of Culture in 2014. During the Latvia's Presidency of the Council of the European Union in 2015 the 4th Eastern Partnership Summit took place in Riga. Riga's administrative divisions consist of six administrative entities: Central, Kurzeme and Northern Districts and the Latgale, Vidzeme and Zemgale Suburbs. Three entities were established on 1 September 1941, and the other three were established in October 1969. There are no official lower level administrative units, but the Riga City Council Development Agency is working on a plan, which officially makes Riga consist of 58 neighbourhoods. The current names were confirmed on 28 December 1990. The climate of Riga is humid continental (Köppen Dfb). The coldest months are January and February, when the average temperature is −5 °C (23 °F) but temperatures as low as −20 to −25 °C (−4 to −13 °F) can be observed almost every year on the coldest days. The proximity of the sea causes frequent autumn rains and fogs. Continuous snow cover may last eighty days. The summers in Riga are mild and rainy with the average temperature of 18 °C (64 °F), while the temperature on the hottest days can exceed 30 °C (86 °F). The head of the city government in Riga is the mayor. Incumbent mayor Nils Ušakovs, who is a member of the Harmony party, took office on 1 July 2009. The city council is a democratically elected institution and is the final decision-making authority in the city. The Council consists of 60 members who are elected every four years. The Presidium of the Riga City Council consists of the Chairman of the Riga City Council and the representatives delegated by the political parties or party blocks elected to the City Council. With 639,630 inhabitants in 2016 as according to the Central statistical administration of Latvia, Riga is the largest city in the Baltic States, though its population has decreased from just over 900,000 in 1991. Notable causes include emigration and low birth rates. According to the 2017 data, ethnic Latvians made up 44.03% of the population of Riga, while ethnic Russians formed 37.88%, Belarusians 3.72%, Ukrainians 3.66%, Poles 1.83% and other ethnicities 8.10%. By comparison, 60.1% of Latvia's total population was ethnically Latvian, 26.2% Russian, 3.3% Belarusian, 2.4% Ukrainian, 2.1% Polish, 1.2% are Lithuanian and the rest of other origins. Upon the restoration of Latvia's independence in 1991, Soviet era immigrants (and any of their offspring born before 1991) were not automatically granted Latvian citizenship because they had migrated to the territory of Latvia during the years when Latvia was part of the Soviet Union. In 2013 citizens of Latvia made up 73.1%, non-citizens 21.9% and citizens of other countries 4.9% of the population of Riga. The proportion of ethnic Latvians in Riga increased from 36.5% in 1989 to 42.4% in 2010. In contrast, the percentage of Russians fell from 47.3% to 40.7% in the same time period. Latvians overtook Russians as the largest ethnic group in 2006. Further projections show that the ethnic Russian population will continue a steady decline, despite higher birth rates, due to emigration. Riga is one of the key economic and financial centres of the Baltic States. Roughly half of all the jobs in Latvia are in Riga and the city generates more than 50% of Latvia's GDP as well as around half of Latvia's exports. The biggest exporters are in wood products, IT, food and beverage manufacturing, pharmaceuticals, transport and metallurgy. Riga Port is one of the largest in the Baltics. It handled a record 34 million tons of cargo in 2011 and has potential for future growth with new port developments on Krievu Sala. Tourism is also a large industry in Riga and after a slowdown during the global economic recessions of the late 2000s, grew 22% in 2011 alone. The Latvian National Opera was founded in 1918. The repertoire of the theatre embraces all opera masterpieces. The Latvian National Opera is famous not only for its operas, but for its ballet troupe as well. The Latvian National Theatre was founded in 1919. The Latvian National Theatre preserves the traditions of Latvian drama school. It is one of the biggest theatres in Latvia. The Mikhail Chekhov Riga Russian Theatre is the oldest professional drama theatre in Latvia, established in 1883. The repertoire of the theatre includes classical plays and experimental performances of Russian and other foreign playwrights. The Daile Theatre was opened for the first time in 1920. It is one of the most successful theatres in Latvia. This theatre is distinguished by its frequent productions of modern foreign plays. Latvian State Puppet Theatre was founded in 1944. This theatre presents shows for children and adults. The New Riga Theatre was opened in 1992. It has an intelligent and attractive repertoire of high quality that focused on a modern, educated and socially active audience. Riga hosted the biannual 2014 World Choir Games from 9–19 July 2014 which coincided with the city being named European Capital of Culture for 2014. The event, organised by the choral foundation, Interkultur, takes place at various host cities every two years and was originally known as the "Choir Olympics". The event regularly sees over 15'000 choristers in over 300 choirs from over 60 nations compete for gold, silver and bronze medals in over 20 categories. The competition is further divided into a Champions Competition and an Open Competition to allow choirs from all backgrounds to enter. Choral workshops and festivals are also witnessed in the host cities and are usually open to the public. The radio and TV tower of Riga is the tallest structure in Latvia and the Baltic States, and one of the tallest in the European Union, reaching 368.5 m (1,209 ft). Riga centre also has many great examples of Art Nouveau architecture, as well as a medieval old town. It is generally recognized that Riga has largest collection of Art Nouveau buildings in the world. This is due to the fact that at the end of the 19th and beginning of the 20th centuries, when Art Nouveau was at the height of its popularity, Riga experienced an unprecedented financial and demographic boom. In the period from 1857 to 1914 its population grew from 282,000 (256,200 in Riga itself and another 26,200 inhabitants beyond the city limits in patrimonial district and military town of Ust-Dvinsk) to 558,000[better source needed] making it the 4th[dubious – discuss] largest city in the Russian Empire (after Saint Petersburg, Moscow and Warsaw) and its largest port. The middle class of Riga used their acquired wealth to build imposing apartment blocks outside the former city walls. Local architects, mostly graduates of Riga Technical University, adopted current European movements and in particular Art Nouveau. Between 1910 and 1913, between 300 and 500 new buildings were built each year in Riga, most[dubious – discuss] of them in Art Nouveau style and most of them outside the old town. Riga has a rich basketball history. In the 1950s ASK Riga became the best club in the Soviet Union and also in Europe, winning the first three editions of the European Cup for Men's Champions Clubs from 1958 to 1960. In 1960, ASK was not the only team from Riga to take the European crown. TTT Riga clinched their first title in the European Cup for Women's Champion Clubs, turning Riga into the capital city of European basketball because for the first and, so far, only time in the history of European basketball, clubs from the same city were concurrent European Men's and Women's club champions. In 2015, Riga was one of the hosts for EuroBasket 2015. Dinamo Riga – a professional ice hockey club established in 2008. It plays in the Kontinental Hockey League. Dinamo was established as a successor to the former hockey team with the same name, which was founded in 1946 but ceased to exist in 1995. Riga, with its central geographic position and concentration of population, has always been the infrastructural hub of Latvia. Several national roads begin in Riga, and European route E22 crosses Riga from the east and west, while the Via Baltica crosses Riga from the south and north. As a city situated by a river, Riga also has several bridges. The oldest standing bridge is the Railway Bridge, which is also the only railroad-carrying bridge in Riga. The Stone Bridge (Akmens tilts) connects Old Riga and Pārdaugava; the Island Bridge (Salu tilts) connects Maskavas Forštate and Pārdaugava via Zaķusala; and the Shroud Bridge (Vanšu tilts) connects Old Riga and Pārdaugava via Ķīpsala. In 2008, the first stage of the new Southern Bridge (Dienvidu tilts) route across the Daugava was completed, and was opened to traffic on 17 November. The Southern Bridge was the biggest construction project in the Baltic states in 20 years, and its purpose was to reduce traffic congestion in the city centre. Another major construction project is the planned Riga Northern Transport Corridor; its first segment detailed project was completed in 2015. The Freeport of Riga facilitates cargo and passenger traffic by sea. Sea ferries currently connect Riga Passenger Terminal to Stockholm operated by Tallink. Riga has one active airport that serves commercial airlines—the Riga International Airport (RIX), built in 1973. Renovation and modernization of the airport was completed in 2001, coinciding with the 800th anniversary of the city. In 2006, a new terminal extension was opened. Extension of the runway was completed in October 2008, and the airport is now able to accommodate large aircraft such as the Airbus A340, Boeing 747, 757, 767 and 777. Another terminal extension is under construction as of 2014[update]. The annual number of passengers has grown from 310,000 in 1993 to 4.7 million in 2014, making Riga International Airport the largest in the Baltic States. The former international airport of Riga, Spilve Airport, located 5 km (3.11 mi) from Riga city centre, is currently used for small aircraft, pilot training and recreational aviation. Riga was also home to a military air base during the Cold War — Rumbula Air Base. Public transportation in the city is provided by Rīgas Satiksme which operates a large number of trams, buses and trolleybuses on an extensive network of routes across the city. In addition, up until 2012 many private owners operated minibus services, after which the City Council established the unified transport company Rīgas mikroautobusu satiksme, establishing a monopoly over the service. Riga is connected to the rest of Latvia by trains operated by the national carrier Passenger Train, whose headquarters are in Riga. There are also international rail services to Russia and Belarus, and plans to revive passenger rail traffic with Estonia. A TEN-T project called Rail Baltica envisages building a high-speed railway line via Riga connecting Tallinn to Warsaw using standard gauge, expected to be put into operation in 2024. Riga International Coach Terminal provides domestic and international connections by coach. Jeļena Ostapenko women's professional tennis player "2017 French open winner"
Mikhail Tal, Soviet-Latvian chess grandmaster and the eighth World Chess Champion, nicknamed "The Magician from Riga"
Tatiana Warsher, a Russian archaeologist known for her studies of Pompeii. Yosef Mendelevich, a Jewish refusenik from the former Soviet Union, also known as a "Prisoner of Zion" and now a politically unaffiliated rabbi living in Jerusalem who gained fame for his adherence to Judaism and public attempts to emigrate to Israel at a time when it was considered to be against the law in the USSR. ^ "Riga City Council". Riga City Council. Retrieved 22 July 2009. ^ "Riga in Figures". Riga City Council. Retrieved 2 August 2007. ^ a b c d "RESIDENT POPULATION BY STATISTICAL REGION, CITY AND COUNTY". Centrālā statistikas pārvalde. Retrieved 7 Jan 2019. ^ a b "Table ISG191. RESIDENT POPULATION BY ETHNICITY AND BY STATISTICAL REGION AND CITY AT THE BEGINNING OF THE YEAR 2018". Central Statistical Bureau of Latvia. Retrieved 24 July 2018. ^ "2.1. Gross Domestic Product – Stratēģijas Uzraudzības Sistēma". sus.lv. ^ "Latvia in Brief". Latvian Institute. 2011. Retrieved 5 November 2011. ^ a b "Riga Municipality Portal". Copyright © 2003–2009, www.riga.lv/LV/Channels/ Riga Municipality. Retrieved 27 July 2009. ^ "Historic Centre of Riga – UNESCO World Heritage Centre". UNESCO. 1997. Retrieved 18 December 2012. ^ "Tourism in Latvia 2017" (PDF). www.csb.gov.lv. Central Statistical Bureau of Latvia. Archived from the original (PDF) on 9 February 2018. Retrieved 9 February 2018. ^ "EUROCITIES – the network of major European cities". Eurocities. Retrieved 8 November 2011. ^ "Union of the Baltic Cities". Union of the Baltic Cities (UBC). Retrieved 8 November 2011. ^ "Union of Capitals of the European Union". Union of Capitals of the European Union (UCEU). Archived from the original on 20 October 2011. Retrieved 8 November 2011. ^ a b "Teritorija un administratīvās robežas vēsturiskā skatījumā" (in Latvian). Cities Environmental Reports on the Internet. Retrieved 2 August 2007. ^ Endzelīns, Did Celts Inhabit the Baltics (1911 Dzimtene's Vēstnesis (Homeland Messenger) No. 227) Archived 9 December 2008 at the Wayback Machine Retrieved 24 July 2009. ^ a b c d e f g h i j k l m n o Bilmanis, A. Latvia as an Independent State. Latvian Legation. 1947. ^ Pronouncing the "i" and "e" separately, REE-eh, is the best approximation to the Latvian rija, as "Ria" would result in an "i" not "ee" sound. ^ "Riga municipality portal". www.riga.lv. Archived from the original on 2012-02-23. Retrieved 2016-02-10. ^ "Coat of arms of Riga". www.riga.lv. Archived from the original on 2007-07-11. Retrieved 2018-06-26. ^ a b c d e Germanis, U. The Latvian Saga. 10th ed. 1998. Memento, Stockholm. ^ a b Reiner et al. Riga. Axel Menges, Stuttgart. 1999. ^ a b Moeller et al. History of the Christian Church. MacMillan & Co. 1893. ^ a b c d e Palmieri, A. Catholic Origin of Latvia, ed. Cororan, J.A. et al. The American Catholic Quarterly Review, Volume XLVI, January–October 1921. Philadelphia. ^ Doma vēsture (history). Retrieved 29 July 2009. ^ Kooper, E. The Medieval Chronicle V. Radopi, 2008. ^ Murray, A., Crusade and Conversion on the Baltic Frontier, 1150–1500. Ashgate, London. 2001. ^ "The Ecclesiastical Review", Vol. LVI. American Ecclesiastical Review. Dolphin Press. 1917. ^ Fonnesberg-Schmidt, I. The Popes and the Baltic Crusades, 1147–1254. Brill. 2006. ^ Fletcher, R.A., The Conversion of Europe: From Paganism to Christianity, 371–1386AD. Harper Collins. 1991. ^ Michell, Thomas. Handbook for Travelers in Russia, Poland, and Finland. London, John Murray, 1888. ^ MacCulloch, Diarmaid (2003). The Reformation: A History. Penguin. p. 150. ISBN 978-0-670-03296-9. Retrieved 2016-02-10. ^ "National History Museum of Latvia". history-museum.lv. Retrieved 2016-02-10. ^ "Russian Retreat 1917". Greatwardifferent.com. Retrieved 16 September 2011. ^ "Population – Database". csb.gov.lv. Archived from the original on 21 February 2012. Retrieved 10 February 2016. ^ Charles, Jonathan (30 June 2005). "Latvia prepares for a tourist invasion". BBC News. Retrieved 2 August 2007. ^ "Remaining Riga mall roof caves in". BBC News. ^ "Riga, Latvia". riga.com. Retrieved 2016-02-10. ^ "Eastern Partnership summit, Riga, 21-22/05/2015". European Council. Retrieved 2016-02-10. ^ Mikk Lõhmus & Illar Tõnisson. "Evolvement of Administrative Division of Tallinn, Riga and Vilnius" (PDF). Tallinn University of Technology. pp. 55, 77. Retrieved 29 June 2010. ^ "Apkaimju projekts" (in Latvian). Riga City Council Development Agency. Retrieved 29 June 2010. ^ "Changes in the Administrative Division of the Territory of Riga after the Loss of Independence (1940–1991)". Riga City Environment Centre "Agenda 21". Retrieved 29 June 2010. ^ "World Weather Information Service – Riga". World Meteorological Organization. Retrieved 4 April 2015. ^ "Riga Climate Normals 1961–1990". National Oceanic and Atmospheric Administration. Retrieved 2 February 2013. ^ "Population Census 2011 – Key Indicators" (PDF). csb.gov.lv. ^ "/ Uzņēmējdarbība / Nosaukti desmit lielākie eksportējošie uzņēmumi Rīgā un Rīgas reģionā". Bizness.lv. Retrieved 12 March 2013. ^ "Latvia Shipping Report Q3 2012 by Business Monitor International in Latvia, Ports & Harbors, Logistics & Shipping". Marketresearch.com. 17 July 2012. Retrieved 12 March 2013. ^ "Tūristu skaits Latvijā pērn pieaudzis par 21%, Rīgā – par 22% – Izklaide". nra.lv. Retrieved 12 March 2013. ^ "Latvian National Opera". Opera.lv. Archived from the original on 26 December 2007. Retrieved 6 May 2009. ^ "Home » Latvijas Nacionālais teātris". teatris.lv. Retrieved 2016-02-10. ^ Nordik IT <http://it.nordik.lv>. "The Daile Theatre – Repertory". Dailesteatris.lv. Archived from the original on 29 April 2009. Retrieved 25 July 2009. ^ "Latvijas Leļļu teātris". puppet.lv. ^ a b "Event Calendar of the 8th World Choir Games 2014, Rīga, Latvia" (PDF). Archived from the original (PDF) on 6 February 2013. Retrieved 5 January 2013. ^ "Riga – European Capital of Culture 2014 :: LIVE RīGA". Liveriga.com. Archived from the original on 7 December 2012. Retrieved 12 March 2013. ^ "History – World Choir Games". interkultur.com. Archived from the original on 6 February 2013. Retrieved 12 March 2013. ^ "Workshops – World Choir Games Riga 2014". interkultur.com. Archived from the original on 6 February 2013. Retrieved 12 March 2013. ^ a b Grosa, Silvija (2003). Art Nouveau in Riga. Jumava. p. 3. ISBN 9984-05-601-5. ^ a b Krastins, Janis (2006). "Architecture and Urban Development of Art Nouveau – Metropolis Riga". International Review of Sociology. Routledge. 16 (2): 395–425. doi:10.1080/03906700600709327. ^ 10 YEARS FIBA EUROPE Federation Focus: Latvia. fibaeurope.com, 24 September 2012. ^ "Explanatory Note on Planning and Building of the Southern Bridge Route". rdpad.lv. Archived from the original on 28 September 2007. Retrieved 21 August 2007. ^ "Dienvidu Tilts; Project of the Bridge". dienvidutilts.lv. Archived from the original on 15 September 2007. Retrieved 21 August 2007. ^ "Dienvidu tilta maģistrālie pievedceļi" (in Latvian). rdsd.lv. Retrieved 27 July 2009. ^ "Izstrādāts Rīgas Ziemeļu transporta koridora 1.posma tehniskais projekts / būvprojekts" (in Latvian). rdpad.lv. Retrieved 8 January 2016. ^ "Kursēšanas grafiki" (in Latvian). Tallink. Retrieved 27 January 2015. ^ "Lidostā "Rīga" svinīgi atklāj jaunās piestātnes ēkas būvniecības sākšanu" (in Latvian). Starptautiskā lidosta "Rīga". Retrieved 27 January 2015. ^ "The trans-European transport network policy connecting East and West". Retrieved 27 January 2015. ^ "The Rail Baltica II Joint venture of the Baltic States is established". Republic of Latvia Ministry of Transport. 28 October 2014. Retrieved 27 January 2015. ^ "Twin cities of Riga". Riga City Council. Retrieved 20 February 2013. 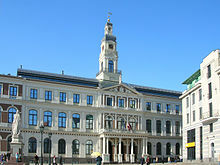 ^ "Aalborg Kommune – Venskabsbyer". Web.archive.org. 14 November 2007. Archived from the original on 14 November 2007. Retrieved 26 July 2009. ^ a b "Hanseatic City Riga". hanse.org. ^ "Sister Cities". Beijing Municipal Government. Archived from the original on 17 January 2010. Retrieved 23 June 2009. ^ "Bordeaux – Rayonnement européen et mondial". Mairie de Bordeaux (in French). Archived from the original on 7 February 2013. Retrieved 29 July 2013. ^ "Bordeaux-Atlas français de la coopération décentralisée et des autres actions extérieures". Délégation pour l’Action Extérieure des Collectivités Territoriales (Ministère des Affaires étrangères) (in French). Archived from the original on 7 February 2013. Retrieved 29 July 2013. ^ Frohmader, Andrea. "Bremen – Referat 32 Städtepartnerschaften / Internationale Beziehungen" [Bremen – Unit 32 Twinning / International Relations]. Das Rathaus Bremen Senatskanzlei [Bremen City Hall – Senate Chancellery] (in German). Archived from the original on 18 July 2011. Retrieved 9 August 2013. ^ "Sister Cities". Dallas-ecodev.org. Archived from the original on 28 May 2010. Retrieved 23 May 2010. ^ "Kobe's Sister Cities". Kobe Trade Information Office. Archived from the original on 21 April 2013. Retrieved 11 August 2013. ^ "Norrköping's twinned cities and cooperation partners" (in Swedish). norrkoping.se. Retrieved 24 March 2019. ^ "Saint Petersburg in figures – International and Interregional Ties". Saint Petersburg City Government. Archived from the original on 24 February 2009. Retrieved 27 July 2009. ^ "yerevan.am – Partner cities". yerevan.am. ^ "Miasta partnerskie Warszawy". um.warszawa.pl (in Polish). Biuro Promocji Miasta. 4 May 2005. Archived from the original on 11 October 2007. Retrieved 29 August 2008. Wikimedia Commons has media related to Riga. Wikivoyage has a travel guide for Riga. The Daugava or russian name Западная Двина is a river rising in the Valdai Hills, flowing through Russia, Belarus, and Latvia and into the Gulf of Riga. The total length of the river is 1,020 km (630 mi); 325 km (202 mi) are in Russia. Latvia, officially the Republic of Latvia, is a country in the Baltic region of Northern Europe. Since its independence, Latvia has been referred to as one of the Baltic states. 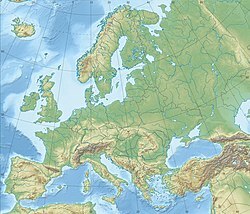 It is bordered by Estonia to the north, Lithuania to the south, Russia to the east, and Belarus to the southeast, and shares a maritime border with Sweden to the west. Latvia has 1,957,200 inhabitants and a territory of 64,589 km2 (24,938 sq mi). The country has a temperate seasonal climate. The history of Latvia began around 9000 BC with the end of the last glacial period in northern Europe. Ancient Baltic peoples arrived in the area during the second millennium BC, and four distinct tribal realms in Latvia's territory were identifiable towards the end of the first millennium AD. Latvia's principal river Daugava, was at the head of an important trade route from the Baltic region through Russia into southern Europe and the Middle East that was used by the Vikings and later Nordic and German traders. Liepāja is a city in western Latvia, located on the Baltic Sea. It is the largest city in the Kurzeme Region and the third largest city in the country after Riga and Daugavpils. It is an important ice-free port. In 2017 population of Liepāja is 69,443 people. Courland, is one of the historical and cultural regions in western Latvia. The largest city is Liepāja, the third largest city in Latvia. The regions of Semigallia and Selonia are sometimes considered as part of Courland as they were formerly held by the same duke. The Baltic states, also known as the Baltic countries, Baltic republics, Baltic nations or simply the Baltics, is a geopolitical term used for grouping the three sovereign states in Northern Europe on the eastern coast of the Baltic Sea: Estonia, Latvia, and Lithuania. The term is not used in the context of cultural areas, national identity, or language. The three countries do not form an official union, but engage in intergovernmental and parliamentary cooperation. Daugavpils is a city in southeastern Latvia, located on the banks of the Daugava River, from which the city gets its name. It is the second largest city in the country after the capital Riga, which is located some 230 kilometres to its north-west. Salaspils is a town in Latvia, the administrative centre of Salaspils Municipality. The town is situated on the northern bank of the Daugava river, 18 kilometers to the south-east of the city of Riga. The Livonians, or Livs, are a Finnic ethnic group indigenous to northern Latvia and southwestern Estonia. Livonians historically spoke Livonian, a Uralic language closely related to Estonian and Finnish. The last person to have learned and spoken Livonian as a mother tongue, Grizelda Kristiņa, died in 2013, making Livonian extinct. As of 2010, there were approximately 30 people who had learned it as a second language. Jelgava is a city in central Latvia about 41 kilometres southwest of Riga with about 63,000 inhabitants. It is the largest town in the region of Zemgale (Semigalia). Jelgava was the capital of the united Duchy of Courland and Semigallia (1578–1795) and the administrative center of the Courland Governorate (1795–1918). Riga Castle is a castle on the banks of River Daugava in Riga, the capital of Latvia. The castle was founded in 1330. Its structure was thoroughly rebuilt between 1497 and 1515. Upon the castle's seizure by the Swedes, they constructed spacious annexes in 1641. The fortress was continually augmented and reconstructed between the 17th and 19th centuries. Sometime in the 1930s, some renovation work was done by architect Eižens Laube. The Latvian government declared the castle its residence in 1938. Today it is the official residence of the President of Latvia as well as home to several museums. Vidzeme is one of the historical and cultural regions of Latvia. Literally meaning "the Middle Land", it is situated in north-central Latvia north of the Daugava River. Sometimes in German, it is also known as Livland, the German form from Latin Livonia, though it comprises only a small part of Medieval Livonia and about half of Swedish Livonia. 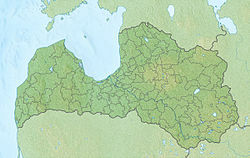 Ikšķile is a town in Latvia, the administrative centre of Ikšķile municipality. It was the first capital of the Roman Catholic Bishopric of Livonia, known by the German name of Üxküll. Saint Meinhard, known from the Livonian Chronicle of Henry, was the first bishop of Üxküll. In 1197 Berthold of Hanover, a Cistercian abbot of Loccum, was made the second bishop of Üxküll. Those days the town was the center of the upcoming crusading activities in the Livonian area. Bishop Berthold moved the episcopal see to Riga, but was killed by the Livs in battle. The Livonian Crusade was the conquest of the territory constituting modern Latvia and Estonia during the pope-sanctioned Northern Crusades, performed mostly by Germans from the Holy Roman Empire and Danes. It ended with the creation of the Terra Mariana and Duchy of Estonia. The lands on the eastern shores of the Baltic Sea were the last corners of Europe to be Christianized. The Victory Memorial to Soviet Army, initially "Monument to the Liberators of Soviet Latvia and Riga from the German Fascist Invaders" is a memorial complex in Victory Park, Riga, Latvia erected in 1985 to commemorate the Soviet Army's victory over Nazi Germany in World War II. It was designed by sculptors Lev Bokovsky and Aivars Gulbis. The complex consists of a 79-meter tall obelisk and two groups of sculptures – Mother Motherland and a band of three soldiers. The history of Riga, the capital of Latvia, begins as early as the 2nd century with a settlement, the Duna urbs, at a natural harbor not far upriver from the mouth of the Daugava River. Later settled by Livs and Kurs, it was already an established trade center in the early Middle Ages along the Dvina-Dnieper trade route to Byzantium. Christianity had come to Latvia as early as the 9th century, but it was the arrival of the Crusades at the end of the 12th century which brought the Germans and forcible conversion to Christianity; the German hegemony instituted over the Baltics lasted until independence—and is still preserved today in Riga's Jugendstil architecture. Articles 4 and 114 of the Constitution of Latvia form the foundation for language policy in Latvia, declaring Latvian to be the official state language and affirming the rights of ethnic minorities to preserve and develop their languages. Livonian language is recognized as "the language of the indigenous (autochthon) population" in the Official Language Law, but Latgalian written language is protected as "a historic variant of the Latvian language." All other languages are considered foreign by the law on state languages. Latvia provides national minority education programmes in Russian, Polish, Hebrew, Ukrainian, Estonian, Lithuanian, and Belarussian. Daugavgrīva Castle is a former monastery converted into a castle, located at Vecdaugava oxbow on right bank of Daugava, in the northern part of Riga city, Latvia. Nowadays here are seen only earthen ramparts. The First Latvian National Awakening or the First Awakening was a cultural and national revival movement between 1850 and 1880 among a group of well-educated Latvians, Jaunlatvieši, who, opposed to the Baltic German dominance in Livonia and Courland Governorates, created the basis for the modern Latvian nation state. It was influenced by the European romantic nationalism movements of Young Germans and Czech National Revival. Most of their efforts were spent on educating Latvians, criticizing Germans and removing the stigma from Latvian language, traditions and culture.